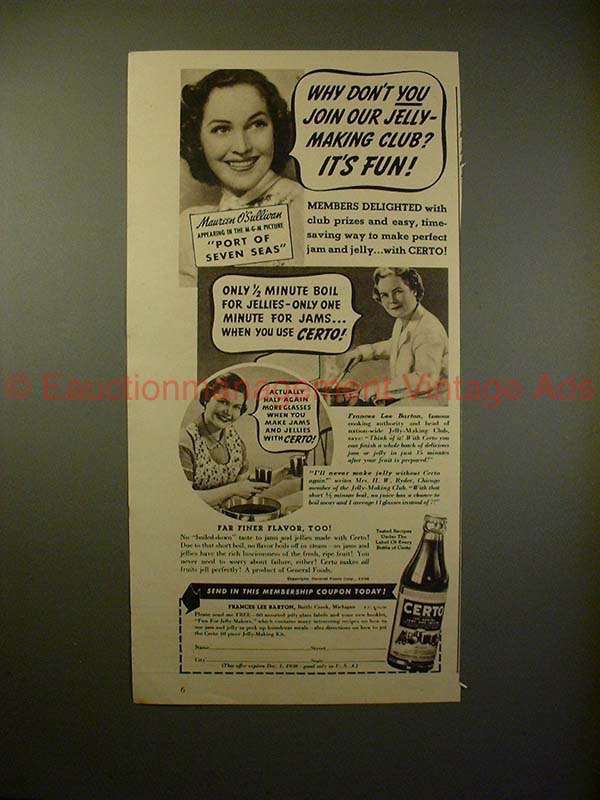 Vintage Paper Ads > Food - Restaurant > Jam Jelly, Peanut Butter > Certo > 1938 Certo Pectin Ad w/ Maureen O'Sullivan - It's Fun!! This is a 1938 ad for Certo pectin, featuring Maureen O'Sullivan! The size of the ad is approximately 5.5x11 inches. The caption for this ad is "Why don't you join our jelly-making club? It's fun!" The ad is in great condition! This vintage ad would look great framed and displayed! Add it to your collection today! 1939 Certo Pectin Ad w/ Una Merkel - Perfect Jelly!! 1943 Certo Pectin Ad - Let the Fruit Waste? Not Me!